Who should I hire? The cheapest? The one with the best website? The one who has multiple awards? Well, if you are reading this than I have the answer for you. 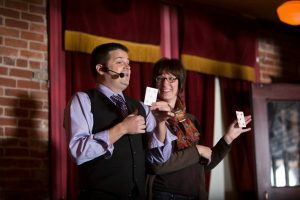 How do you hire the right magician/entertainer for your event? I have listed a few qualities that are important when hiring your next magician/entertainer. 1.) You want an magician/entertainer that is fully insured. You would expect any other business to be fully insured so why not an entertainer. Its a form of professionalism that speaks volumes to the customer that indeed you do care about your quality of work and the safety of others at your event. 2.) Experience is essential! You want a magician/entertainer that has the show experience to entertain at your event! Show time is crucial in the world of entertainment. The longer the entertainer has been in front of people perfecting their craft is the entertainer you want in front of your guests. Entertainers that have experience are able to work the room and make the event even more entertaining by building off of situational comedy. Its hard for an inexperienced entertainer to do that. Inexperienced entertainers are too focused on getting to the the end result whereas an experienced entertainer will get to the end result but take you on a entertaining ride until the end. 3.) The cheapest magician should be a red flag. If you saw two products that claimed to be the same but yet one was cheaper you might ask yourself why? This is the type of thinking you should have when obtaining quotes from entertainers. Why is this person so much cheaper than the other? More than likely it is because the entertainer doesn’t have confidence in their skills or their skills are not satisfactory for the entertainment value. The entertainer with the higher fee is confident that they will deliver a quality show. 4.) 100% money back guaranteed? If the entertainer is not willing to guarantee their work you may want to question why they don’t guarantee their work? Most of the time it goes back to the lack of experience. They are not confident in their skills to offer a guarantee offer. 5.) Do they have a professional website along with video testimonials and show footage? You want to make sure the entertainer has a professional website that shows you that he/she is very serious about their business. Do they have past client testimonials and show footage? What have others experienced? Reviews are essential int his day and age and there is no reason entertainers should be exempt. Finding the right entertainer can be difficult at times as you are unsure of who you are really hiring. It is important to ask questions as I have listed above to ensure you are hiring the right entertainer for your event! There is nothing worst than choosing the wrong entertainer for your event and the guests and host are left disappointed.